The real steel Stoner 63, also known as the XM22/E1, was an American modular weapons system designed by Eugene Stoner in the early 1960s. It was put to use in very limited numbers in Vietnam by members of the United States Navy SEALs and several law enforcement agencies at the time. A revolutionary modular design, it could be configured in lighter assault rifle, light machine gun, lighter or heavier barrel, short commando and other variants. 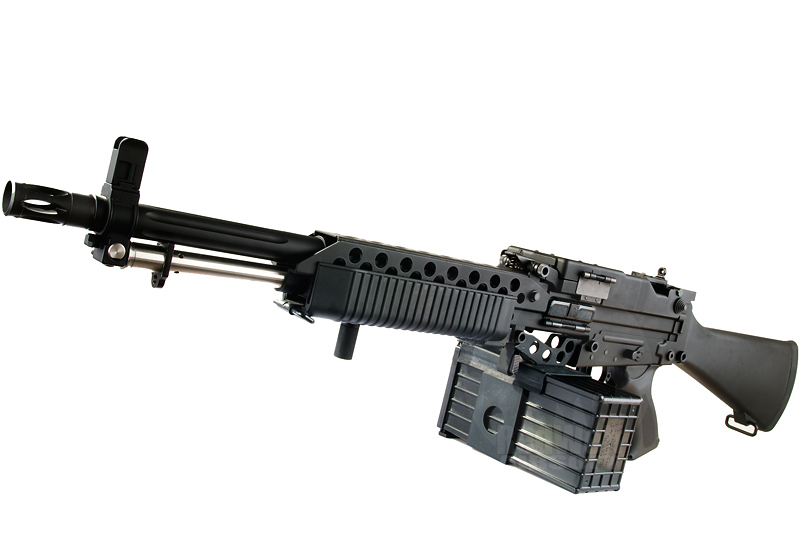 It was ultimately deemed too complex and phased out by the 1980s (in favor of the M16 / M4 / M249 combo). Made of a blend of metals and polymer, the weapon has excellent heft and balance without being too unwieldy. 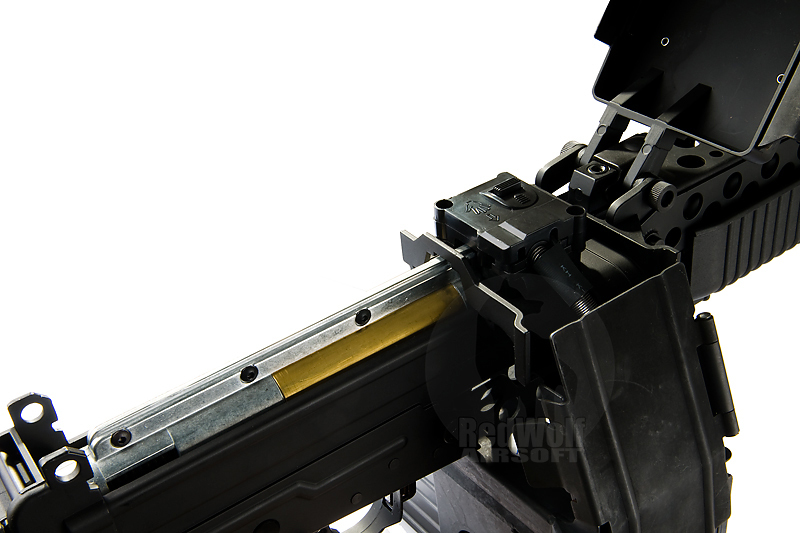 It uses a version 2 type gearbox with 8mm bearings and a G&P M120 high speed motor. 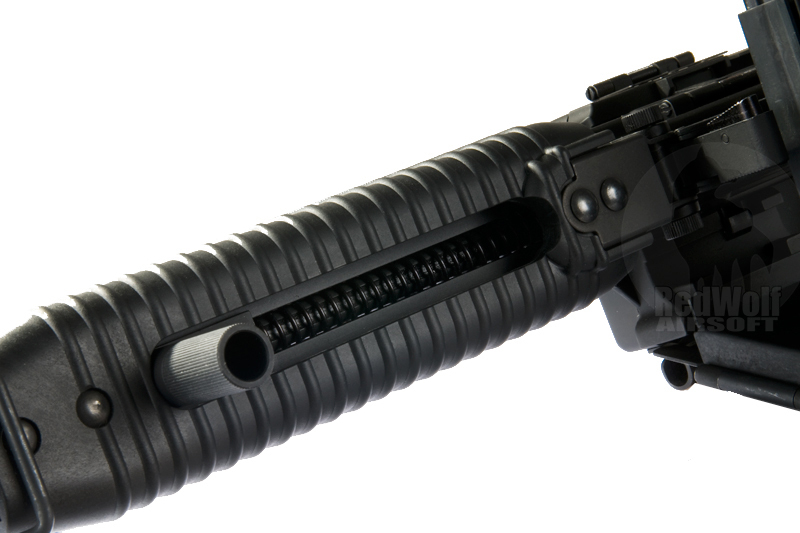 It uses a 440mm long inner barrel putting it about midway between an M4A1 and M16. 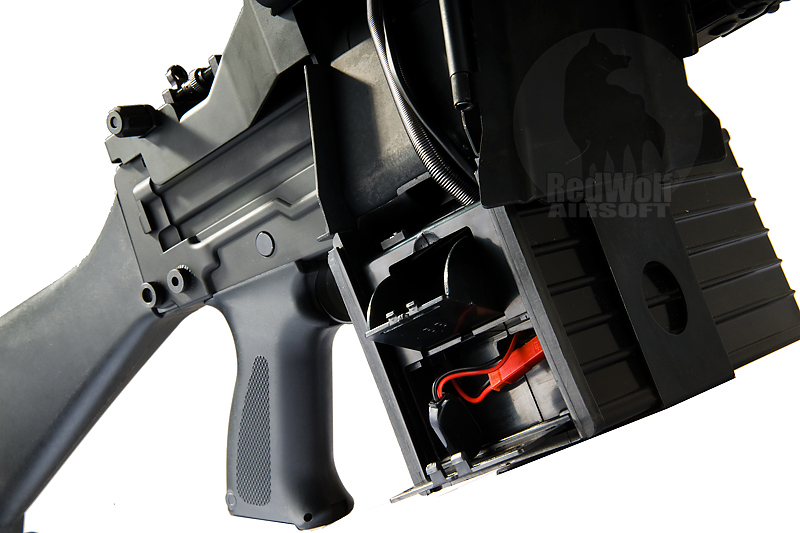 The included box magazine holds 1200 BBs which is less than most MG boxes in airsoft (typically 2500-4000 ) but is still more than enough ammo for support use and is significatly easier to use unlike the much bulkier larger boxes found on M249s or M60s. Despite its obvious machine gun orientation, the weapon is select-fire between semi and full-auto making it more flexible for use in skirmishing depending on whether you need to conserve ammo, reserve firepower or lay down suppression fire. 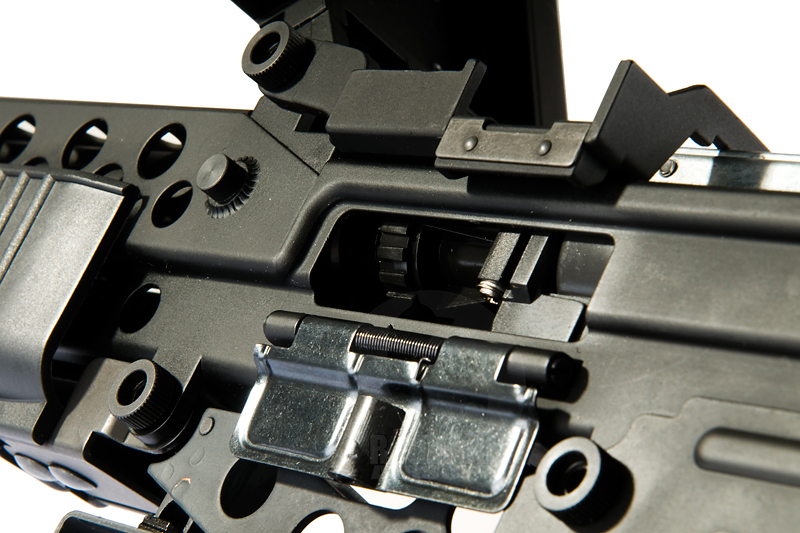 The battery connection is rear wired in the stock somewhat similar to classic M16 AEG setup. As such, its large capacity storage allows it to take anything up to and including a 10.8v 4400mAh NiCad battery (battery not included). If you are a big fan of machine guns but want to add one to your armory that is actually small and light enough to skirmish with easily then the G&P Mk.23 has to be a serious contender. 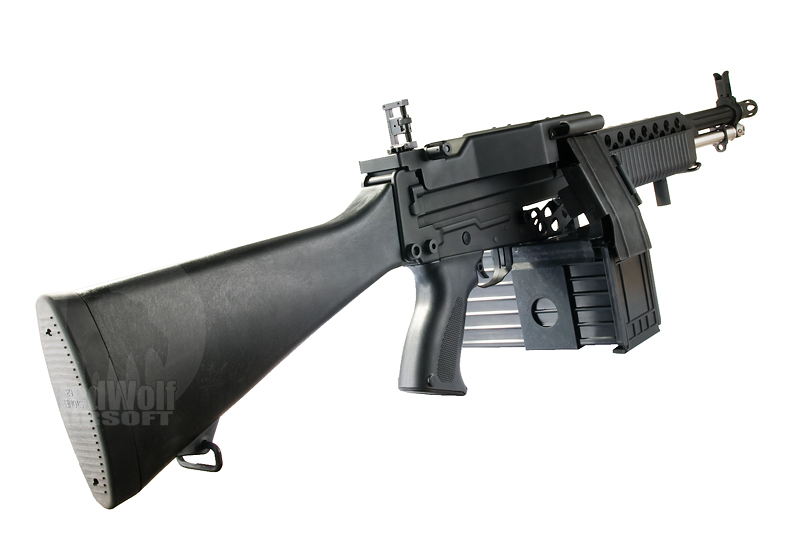 MG on the outside but M16 family compatible on the inside, it has a lot of potential as an Airsoft squad assault / support gun. Given the extreme rarity of the real steel (only about 400 where made), this is not only cheaper but easier to get your hands on. For those of you who want an MG configured Stoner 63 for display, reference, photographic or filming use but not actual live/blank ammo shooting then this is obviously a superior option. 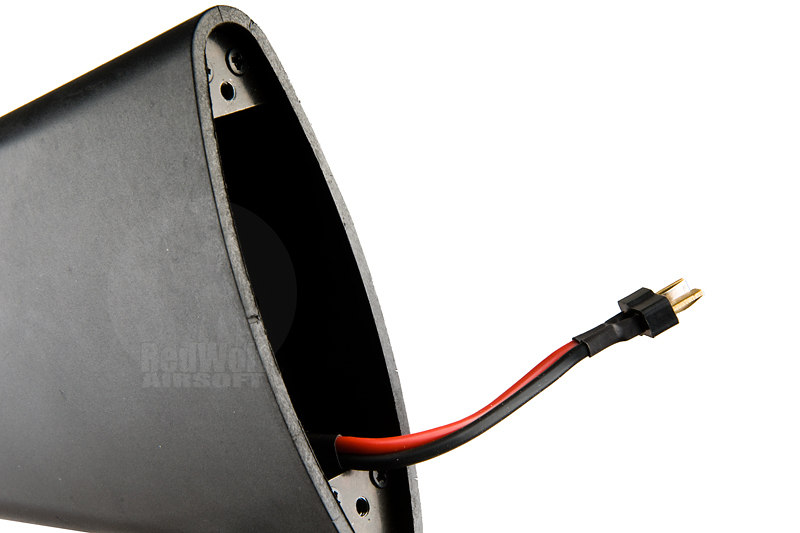 Battery sold separately - get a 9.6v LARGE type battery to fit into the fixed stock, like A-BATT006 as shown in the related products section. Please note it is not possible to convert this gun to shoot semi-auto only.